A pair of simple straps have proven to be super useful on many trips. So much in fact that I decided to write this article about it. You can buy straps at most hardware/DIY store. I guess most people use them to strap things on their car or trailer, but they are super useful on bicycle tours. The first pair of straps I got when I bought a rug. I was on my bicycle and had to transport it across town. The rug was rolled up, I strapped it to my top tube and cycled home with the whole thing between my legs. I couldn't reach the pedal very well, but the straps, costing less then having it delivered at home, already paid themselves back. 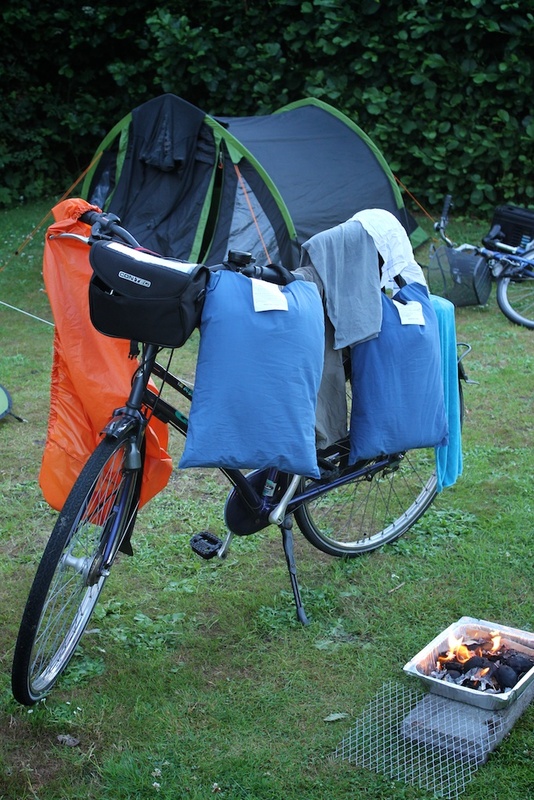 The number one use is to strap luggage like dry/compression bags to your bicycle's frame or rear rack. For squishy luggage straps are not (very) elastic work best. Give them a good pull to make sure they are tight enough. More solid objects are best kept in place with something that is slightly elastic, like a bungee cord. However bumps and vibrations can make things fall off. Elastic straps are most useful when you have several and they are adjustable in length so that you can secure a wide variety of loads. Beware that elastic straps can also be dangerous when they spring loose from being under high tension. Another thing to take into account is that overstretching an elastic strap can make it lose its elasticity. When taking the bicycles in the train or bus you need to be careful of them not falling over as the train changes tracks, or the bus is going over bumps and turning. Instead of holding on your bicycles the whole time a simple strap can secure a whole bunch of them. Often times when strapping the bikes in the train other people remark that they think it is a good idea, and that I really look like what I am doing. Most of the time there is an attachment point in the train to loop the strap through, however sometimes you cannot reach it. In a specific model of train it is also possible to loop it around the trash can that is mounted on the wall. Use it as shoulder strap to carry bags on your shoulders. You can also make a backpack with two. Combine two straps to make an even longer one. Usually I bring two straps which are each 3 meters long, it is usually enough for going on a trip with two bicycles, but I think I might bring some more on longer trips. One thing you need to be careful of is that because straps are usually longer than you need them to bee is that you tie up the loose ends, otherwise it might get caught in your wheel while riding, which can be dangerous.